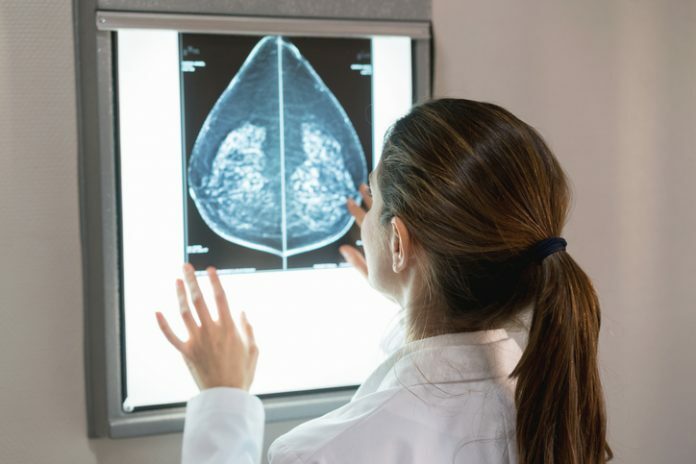 Carrying out a commercially available 21-gene test on patients' breast tumors could allow more than two thirds of women with the most common type of early breast cancer to avoid chemotherapy, according to data from a landmark study published yesterday. Results from the prospective study, called Trial Assigning Individualized Options for Treatment (TAILORx), showed that for women whose tumors are hormone receptor–positive, human epidermal growth factor receptor 2 (HER2)-negative, axillary node-negative, and generate intermediate scores on the 21-gene Oncotype DX recurrence-score assay, hormone therapy was just as effective at preventing disease recurrence as hormone therapy plus chemotherapy. The 21-gene recurrence-score Oncotype Dx assay is one of several commercially available gene expression assays that can offer prognostic insight in hormone receptor-positive breast cancer. The test scores the tumor from 0 to 100, with a high score—26 or above—indicating that chemotherapy will improve therapeutic efficacy, and a low score—10 or under—suggesting a very low likelihood of distant recurrence at 10 years, which is unlikely to be affected by adjuvant chemotherapy. What is less clear is whether chemotherapy will be of any benefit to the majority of patients who have a mid-range recurrence score. The prospective TAILORx study was designed to help to discover whether chemotherapy is beneficial for women with a mid-range recurrence score of 11 to 25, as well as to prospectively confirm that a low recurrence score of 0–10 is associated with a low rate of distant recurrence if patients receive endocrine therapy without adjuvant chemotherapy. The study enrolled 10,273 women, of whom 9719 with follow-up data were included in the main analysis set; 6711 women (69%) had an intermediate recurrence score of 11–25, while 1619 (17%) had a low recurrence sore of 10 or less and 1389 (14%) had a recurrence score of 26 or higher. Women in the intermediate recurrence score group were randomly assigned to receive either endocrine therapy plus chemotherapy or endocrine therapy alone. The most common chemotherapeutic regimens used to treat women in the dual, chemoendocrine therapy group were either a docetaxel–cyclophosphamide regimen or anthracycline-containing regimens. The type of hormone therapy administered was dependent upon whether women were premenopausal or postmenopausal—91% of postmenopausal women received an aromatase inhibitor-based regimen, whereas premenopausal women were most commonly prescribed either an endocrine therapy regimen comprising either tamoxifen alone or tamoxifen followed by an aromatase inhibitor (78%). Suppression of ovarian function was used in 13% of premenopausal women. The median duration of endocrine therapy was 5.4 years. The average duration of follow up in the intermediate recurrence score group was 90 months for invasive disease-free survival and 96 months for overall survival. The trial results showed that for women in the intermediate recurrence score group, endocrine therapy was no less effective than hormone therapy plus chemotherapy at prolonging disease-free survival. The rates of invasive disease-free survival at 9 years were similar for both groups, at 83.3% for the endocrine-therapy group and 84.3% for the chemoendocrine therapy group. Rates for freedom from disease recurrence at a distant site were also similar, at 94.5% and 95% for the endocrine therapy and chemoendocrine therapy groups, respectively, as were rates for freedom from disease at a distant or local-regional site (92.2% and 92.9%, respectively) and for overall survival (93.9% vs 93.8%.). “The 9-year rate of distant recurrence in women with a recurrence score of 11 to 25 in our trial was approximately 5%, irrespective of chemotherapy use,” the authors write. They say the data “provide evidence that that adjuvant chemotherapy was not beneficial in these patients.” Exploratory analyses did suggest that the addition of chemotherapy was associated with some benefit for women 50 years of age or younger who had a recurrence score of 16 to 25, but not for those whose score 15 or lower. Forty percent of women who were 50 years of age or younger had a recurrence score of 15 or lower. “Updated results for patients with a low recurrence score of 10 or less, who were previously reported as having a 1% distant recurrence rate at 5 years in our trial, now indicate a 9-year rate of distant recurrence of approximately 3%,” the authors add. “The results of our trial suggest that the 21-gene assay may identify up to 85% of women with early breast cancer who can be spared adjuvant chemotherapy, especially those who are older than 50 years of age and have a recurrence score of 25 or lower, as well as women 50 years of age or younger with a recurrence score of 15 or lower,” the authors conclude.